Outside of full engine testing, very few facilities have the capability of running at elevated pressures, let alone pressures representative of the overall pressure ratio of an aero engine. The TuRFR and internal deposition facilities exhaust to ambient pressure. In these facilities, cooling geometry mechanisms are operated by matching the pressure ratio and fluid temperatures which therefore means Mach number is matched. However, since the absolute pressure is not matched, these test facilities operate with a substantially lower fluid density than in an actual engine. This has direct implications to particle deposition testing. Higher fluid density means higher particle Reynolds numbers which in turn yields a lower effective Stokes number. The Stokes number describes the ability of a particle to follow flow streamlines; a Stokes number St<<1 implies the particle follows the streamlines well, while a Stokes number St>>1 implies the particle follows a more ballistic trajectory. In addition, higher density flow yields greater wall shear stress and heat transfer which effect particle sticking mechanics. 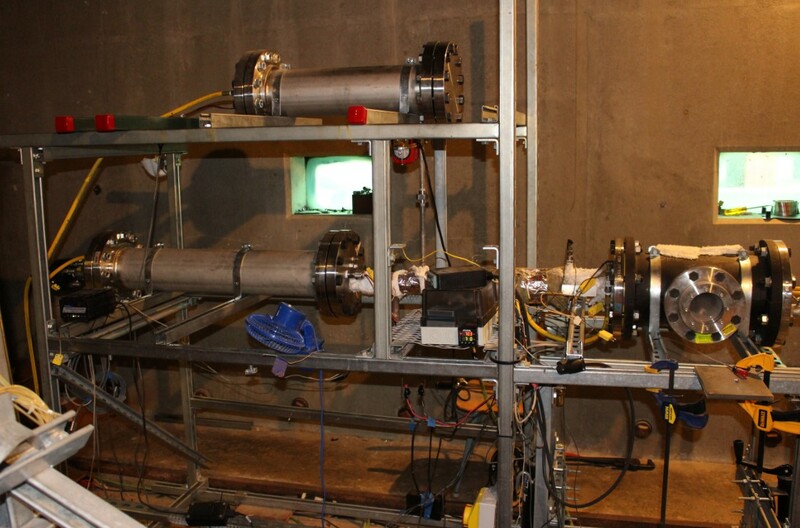 In an effort to study the effects pressure has on particle deposition, a high-pressure test facility was constructed for the Turbine Aerothermal Laboratory at the ARC. Shown in the schematic and digital image below, the facility is capable of operating at up to 18 atmospheres and flow temperature up to 1,200 °F and is used to study deposit formation on an impingement plate test coupon. Testing has found that deposition at higher pressure changes the deposit structure as well as reduces the volume of captured deposit.